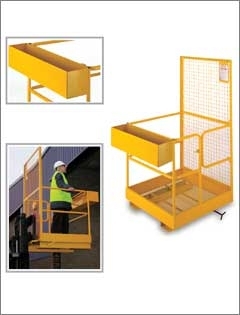 Designed to provide safe working access to inaccessible places, accommodating two people plus their tools and equipment. Manufactured according to Health and Safety guidance note PM28 (3rd Edition) Dec. 2005. Approved to be used by 2 persons of average weight. Fully welded with a raised expanded metal floor, located and welded into a formed kickboard surround. Rear RSA frame with wire mesh panels. Hinged entry gate with spring return to closed position. Spring loaded retention bolt holds the gate in the closed position). Supplied with a tool box. (W) 184 x (D) 83mm, with inside clearance 545mm and overall clearance 921mm.